In previous articles I've covered how to survive in the wilderness and other general survival skills. In this article I'll cover "Bugging In". In some situations it may be better to just hunker down where you are and wait it out instead of running to the hills. If you are not in immediate danger, why would you leave a perfectly good shelter like your house or apartment? If you're prepared and stocked up on the basic necessities you don't need to go anywhere. So let's take a look at what you'll need to be prepared in a Bug-In situation. Potassium permanganate ,otherwise known as KMnO4, is an inorganic substance that has various uses. It can come in crystal, tablet, or powder form. This chemical is an oxidizing agent that can be utilized in water treatment facilities to remove strong odors from water. When properly diluted, potassium permanganate is used to improve the quality of water by reducing organic matter and harmful organisms. Some other common uses of potassium permanganate include industrial, biomedical and as a disinfectant. Because of it's many uses Potassium Permanganate would be an excellent item to include in your survival kit. So you've put together a survival kit, you probably have a knife, a fire kit, a first aid kit, and other necessities you may need to survive. Have you thought about packing a rifle? I'm sure some of you have. Fact is, a small, lightweight rifle could be just what you need in a wilderness survival situation. Whether it's for hunting game for food or personal protection, a good survival rifle can save time, effort, and maybe your life. What makes a rifle a "Survival Rifle"? The main features that make a great survival rifle are: small size, lightweight, reliability, and portability. No one wants to lug around a heavy, bulky monstrosity that gets in the way and won't fit in their pack. Most are .22 caliber, you can carry a lot of .22lr ammo, it's cheap and easy to acquire, though there are some of larger caliber. I've compiled information on several survival rifles, from excellent sources, so you can see all the different options and choose the one that's right for you. A well made shelter can give you protection from the elements as well as insects and predatory animals. It can also make you comfortable in an otherwise stressful situation, contributing to your well-being, piece of mind, and will to survive. In some situations, your need for a shelter may be more important than your need for food and possibly even your need for water. Long-term exposure to cold can cause fatigue and weakness (exhaustion). An exhausted person may develop a "I don't care anymore" outlook, and lose the will to survive. The most common error in making a shelter is to make it too large. A shelter must be large enough to protect you. It must also be small enough to contain your body heat, especially in cold climates. Hypothermia is a very real and serious threat facing people who are exposed to the elements in a survival situation. In this article you'll read about how to find and construct a functional shelter in survival situations. Is suitable for emergency signaling, if necessary. In a survival situation, clean, drinkable water is the most important thing . You can survive without food for weeks or even months, but if you go without water for just one day you will start a downward slide into dehydration and be in serious trouble. A minimum of two quarts (liters) of clean water per day, per person is the recommended intake. In hot,cold or dry environments, or if you are physically active, two quarts (liters) of water a day may not be enough to sustain you over a period of days or weeks. In general the higher the temperature the greater your water intake needs to be. If you are active or exposed to the hot rays of the sun you may need as much as a gallon of water per day to stay hydrated. Water lost through perspiration and normal respiration must be replaced in order to stay healthy and function at top efficiency. Water is also needed to digest the food you eat, especially if it is salty or you eat heavy foods like meat. If you are losing more water than you are taking in, you will become dehydrated. Some foods that contain a high amount of water, such as some fruits and berries may actually aid in providing water, but not enough to keep you hydrated, you will still need drinking water. If you're going to survive a long term survival situation, you're going to need energy, to get energy, you need to intake nutrients by eating. Now, if you have a prepared survival kit or BOB, you probably have MRE's and other sources of short term food supplies, or maybe you have a location that you have stocked with emergency food. So, what happens when that food runs out? I'll tell you what I would do, I'd hunker down and go get it myself. In this article I'll be talking about survival hunting,trapping, and scavenging for food. It is essential to understand where to find survival food, even though food is the least pressing wilderness survival need. With plenty of water and a comfortable resting place, most of us can live approximately three weeks without food. However, food is important for your mental and emotional state, as well as a source of energy and to maintain a normal body temperature. In a survival situation, you have to take advantage of everything available to eat. Most wilderness areas are full of natural food, ranging from plants to insects. The food sources you can exploit are determined by the habitat you are in. Vary your diet to make sure you get the appropriate proportions of fat, protein, carbohydrates, minerals and vitamins. Meat and fish are good sources of protein and fat and provide virtually everything a long-term survivor would need. However, at the first stage of a survival situation, plants are the most appropriate diet as plants are easily accessible and contain the necessary carbohydrates. In survival situations, having the skills to start a fire can often be the difference between life and death. Fire can be used for many things. It can provide warmth,purify water,cook and preserve food, keep predatory animals away and signal for help. It can be a confidence booster and provide peace of mind. The following is a collection of firecraft skills that I've compiled through personal experience and research. 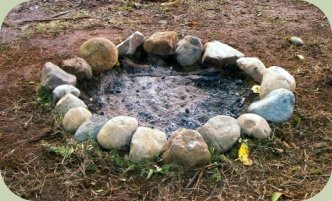 Let's begin with the steps for successfully creating a fire.